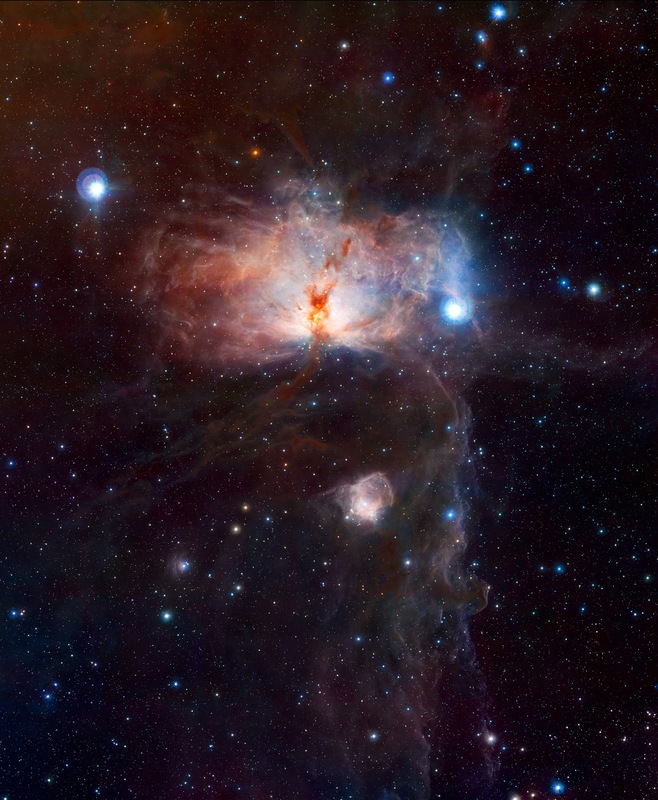 This VISTA image shows the spectacular star-forming region known as the Flame Nebula, or NGC 2024, in the constellation of Orion (the Hunter) and its surroundings. In views of this evocative object in visible light the core of the nebula is completely hidden behind obscuring dust, but in this VISTA view, taken in infrared light, the cluster of very young stars at the object’s heart is revealed. The wide-field VISTA view also includes the glow of the reflection nebula NGC 2023, just below centre, and the ghostly outline of the Horsehead Nebula (Barnard 33) towards the lower right. The bright bluish star towards the right is one of the three bright stars forming the Belt of Orion. The image was created from VISTA images taken through J, H and Ks filters in the near-infrared part of the spectrum. The image shows the full area of the VISTA field and is one degree by 1.5 degrees in extent. The total exposure time was 14 minutes.